Last week Amazon sent out invitations for a media event scheduled for Wednesday, September 28th, and that is tomorrow. We have heard tons of rumors regarding the Amazon Android tablet and it appears we’ll be seeing just that come tomorrow. The name being tossed around is “Kindle Fire” and it will be a 7″ tablet heavily skinned to look nothing like Android, more details below. Earlier this month TechCrunch had all the details, and claimed they even enjoyed some hands-on time with the tablet. Tomorrow marks the day we’ll all find out what Amazon has been pushing through the pipelines as of late. According to new details it will be called the Kindle Fire, and will be marketed different than current e-reader tablets as they plan to sell both. It will be 7″ and run with an unknown TI dual-core processor. According to the same report, this tablet is made by the same company making the BlackBerry Playbook so it will resemble the BB tablet in terms of design. Given the same design the familiarities end there, the Kindle Fire will have a much better user interface that is complete, as well as a stable and smooth ecosystem all ran by Amazon. We have heard it will run on Android 2.3 Gingerbread but look nothing like it. 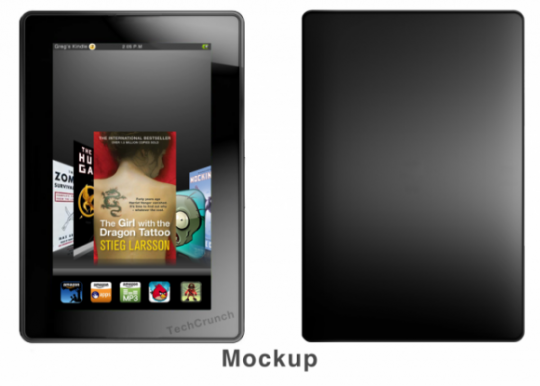 Amazon has made their own unique Kindle UI that will have zero resemblance to Android. It will also be offered with their own suite of applications like the Amazon App Store, Kindle app, Amazon Prime for movies, Amazon MP3 and everything else that Amazon has to offer, and show as little Android and Google as possible. We don’t have any confirmed full details or a price as everything has remained extremely tight lipped by Amazon and their manufacturers. While this is all just rumors and speculation for now we will know everything after the event tomorrow. Be sure to stay tuned to Android Community as we will be live in NYC to get a first hand look at what is revealed by Amazon come tomorrow morning.